(Nanowerk News) Using a simple and direct hand-writing process, researchers have successfully produced ultralong polymer-carbon nanotube (CNT) composite fibers with length of over 50 cm as precisely controlled conducting wires for flexible electronics. The results have been reported in the February 8, 2015 online edition of Nano Letters ("Direct Writing of Half-Meter Long CNT Based Fiber for Flexible Electronics"). The as-prepared continuous fibers exhibit high electrical conductivity as well as superior mechanical flexibility (no obvious conductance increase after 1000 bending cycles to 4 mm diameter). Such functional fibers can be easily configured into designed patterns with high precision according to the easy “writing” process. The easy construction and assembly of functional fiber shown here holds potential for convenient and scalable fabrication of flexible circuits in future smart devices like wearable electronics and three-dimensional (3D) electronic devices. 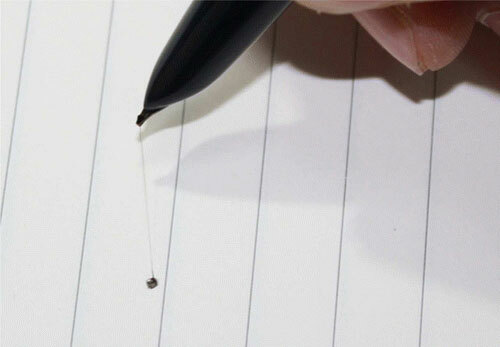 The ultralong submicron fibers can be directly written by ordinary pen, possessing ideal uniformity as well as good alignment of CNTs inside polymer fibers. The research shows that thinner fibers exhibit higher electrical conductivity according to better alignments of CNTs in fibers. Accurate positioning control and fast assembly have been accomplished conveniently trough this simple writing method. The team also demonstrated that such fibers are suitable for flexible electronic device applications with superior mechanical flexibility.